Ophthalmologists recommend children to do preventive exercises. 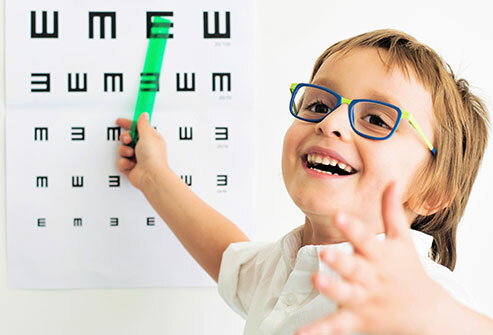 Many parents are faced with a problem when the child begins to decrease vision. The reasons for this is sufficient: Genetics, part of the game on the tablet, hours of viewing cartoons. To the future child does not need to buy glasses, ophthalmologists recommend children to do preventive exercises for the eyes! Explain to the child why he needs to do exercises, not so easy, but if you perform it effortlessly, pipsqueak would be happy to participate in this process! Help your child to imagine that his eyelids and lashes it is a beautiful butterfly wings. It is necessary to blink, all movements should be light, airy and quite fast. In this case, it appears that the eyes are the arrows, which look to the right and to the left. It is necessary to perform at least 20 repetitions, thus it is necessary to closely monitor the level position of the head. This game is known to all children. When performing this exercise must be firmly squeezed her eyes shut for about 5 seconds, then relax them completely. Child represents traffic lights themselves. It should cover the right, the left eye. It should be as long as possible not to blink. Every day this time will begin to increase. Once the child blinks, it should close their eyes and imagine that he was asleep. The voltage from relaxation beneficial effect on the muscles. You must attach a small window on the circle . The child must translate gaze from him at a distant object. For example, on the street pole, a tree, an adjacent building.